Kevin "Flash" Derby, a Carloina Crown snare player last summer, submitted this one. 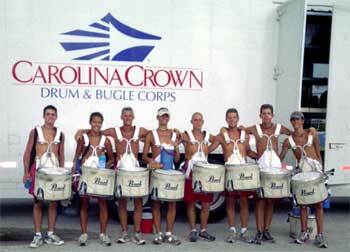 "My mom took this picture of the snare line right before a big storm drove through town. It was after the last run-through of our show of the year, on the Saturday of finals. I am third from the right in the picture -- however, I marched third from the left. I am 22 now so I will never be able to march with these guys again. This past summer was incredible for me and I will never forget these guys! I wish them the best of luck next year at Crown, except for Rob who is old like me. Thanks Guys!"